In September of 1996, a group of Jazz and Blues enthusiasts founded the Fort Pierce Jazz & Blues Society. More than 20 years later, the Society is still Jazzin' It Up. In a large part, this is thanks to the generosity and support of its membership and corporate sponsors. 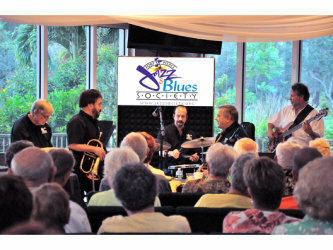 The entire community on the Treasure Coast has embraced the Fort Pierce Jazz & Blues Society. Jazz Jams have infused the area with talented, local, young and seasoned musicians and many well-known guests from all over the country. The formula for success is simple: provide great music, performed by great players. Always respect and consider the people who support the effort. Throw in some funds. And, voila! You have the ingredients necessary to fulfill our mission. The mission of the Fort Pierce Jazz & Blues Society is to promote the growth, appreciation and performance of Jazz and Blues: two great American Music Art Forms. Through annual scholarship awards, educational workshops, clinics and master classes, weekly jazz jams, tri-annual Waterside Blues Festivals, Mardi Gras and Jazz Week Celebrations and community outreach programs. 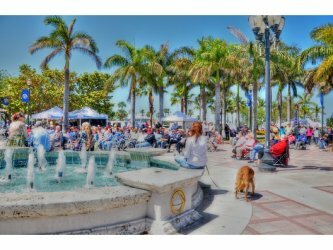 The Fort Pierce Jazz & Blues Society will forge ahead to accomplish and achieve our many worthwhile goals: expanding educational programs, musical forums, social events, city support and awareness, promoting artistic culture.